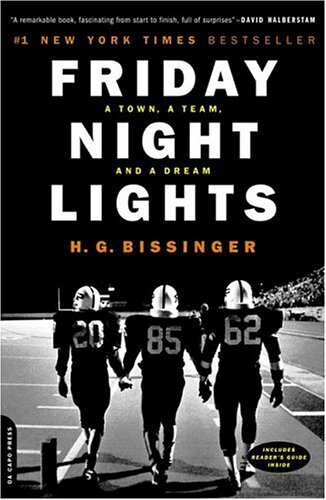 For the spot of “A book based on a true story” I read Friday Night Lights by H. G. Bissinger. This was a real stretch out of my comfort zone, because I am definitely not the world’s #1 sports fan- but I actually enjoyed this book a lot. Here is the summary from Amazon: Odessa is not known to be a town big on dreams, but the Panthers help keep the hopes and dreams of this small, dusty town going. Socially and racially divided, its fragile economy follows the treacherous boom-bust path of the oil business. In bad times, the unemployment rate barrels out of control; in good times, its murder rate skyrockets. But every Friday night from September to December, when the Permian High School Panthers play football, this West Texas town becomes a place where dreams can come true. With frankness and compassion, H. G. Bissinger chronicles a season in the life of Odessa and shows how single-minded devotion to the team shapes the community and inspires–and sometimes shatters–the teenagers who wear the Panthers’ uniforms. I originally purchased this book for a different reading challenge that I was doing last year- this was supposed to be for a book set in the year I was born- it takes place in 1988. I didn’t end up reading it last year, but I’m glad I finally got around to reading it. The author spent a year in Odessa following the football team in their quest to be state champions, but this book wasn’t ONLY about football like I thought it would be. -This book talked about the city of Odessa, TX and what life is like in a West Texas oil town. It sounded ROUGH, y’all. The oil boom was over and times were tough, money was tight, and families were stressed. -This book talked about the lives of high school students. The way they acted with each other. The way they acted in school (spoiler: not great. No homework. Special treatment so they wouldn’t be ineligible to play.) The way they had an unspoken contest to see who could drink the most. Things like that. -This book talked about race. Even in the late 80’s, race was a HUGE factor in this small town- and it probably still is today. But really, racism was at LARGE and people were not afraid to show it. -This book talked about family. Or lack of family. Or terrible families. I felt bad for most of the players on the team because they each seemed to have a less-than-ideal situation back at home. -This book talked about football- and did it in a great way! I wasn’t bored reading about the games- those were actually my favorite parts! It was like I was on the field with them. I won with them. I lost with them. -This book had a nice epilogue. It was fun to see where the players ended up after the season ended. Where they were a few years later. And even where some of the players wound up 10 years later. Now I need to watch the movie “Friday Night Lights” and see how it compares. I also want to watch the show “Friday Night Lights” but I know that it is really not much like the book at all, so that can probably wait a bit.